On Active Directory domains that are migrated from Windows Server 2003, you may still have FRS (ntfrs) traces for replication of SYSVOL within your environment. As a result of migrating to a newer version, such as Windows Server 2012 R2 or even Windows Server 2016, you must migrate SYSVOL replication from FRS to DFSR, which is now the standard. This is not automatic. If you are installing a domain from scratch on a recent OS, it will use DFSR directly. The bottom line is that you no longer need to have a domain controller in Windows Server 2003 or earlier in your environment to migrate to DFSR. In this example, the infrastructure has just been migrated from WS 2003 to WS 2016. Before going head to head in the migration to DFSR, it is essential to check that the health of your Active Directory is good. For that, I advise you to use the commands repadmin and dcdiag, but also to make a turn in the observer of events. 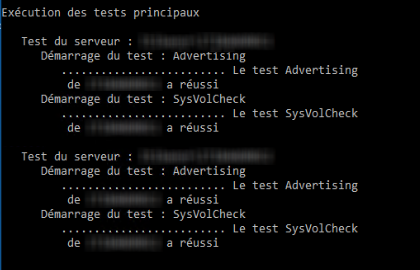 The AD Replication Status Tool is interesting too.